Key Difference: Snow, sleet and freezing rain are all different types of precipitation that occur during winters. Snow is the frozen form of precipitation which falls in the form of six sided ice crystals. Sleet falls as ice pallets and can be found bouncing off the wind-shields or roof during the winters. Freezing rain refer to those rain droplets which freeze upon hitting the surface of ground. Snow is a type of frozen precipitation which falls down to the Earth in the form of six sided ice crystals. These ice crystals stick to each other while falling down and take the form of snowflakes. Snow forms in the clouds but the temperature has to be below freezing. The temperatures (temperature profile in the troposphere) need to be below freezing point for the formation of snow. Snow can be categorized into light, moderate and heavy depending upon the intensity. Sleet falls as ice pallets and can be found bouncing off the wind-shields or the roof during the winters. It originally falls as snow, but after reaching a warm layer of temperature, it melts and takes the form of rain. However, after exiting from this warm layer, the raindrops reshapes into pallets of ice as they enter the next cold layer near the surface of the Earth. Freezing rain refers to those rain droplets which freeze upon hitting the surface of ground. 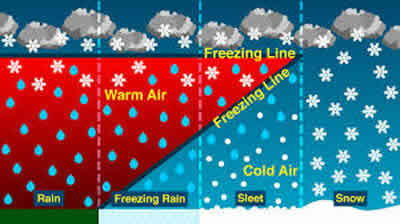 Freezing rain falls into a shallow layer of cold air which is present near the ground surface. It leaves a glaze coating. It is important to mention that it falls just like normal rain, and it only takes the frozen form on contact with any type of surface on Earth like trees and power lines. Freezing rain also starts with the same set-up as snow. However, after entering a warm layer, the snowflakes melt and take the form of rain. The warm layer is very deep and extends upto the earth’s surface. Unlike sleet, it does not get time to refreeze and thus ends up falling as rain drops. Thus, all three forms of precipitation can be easily differentiated. Snow falls through cold air and reaches the surface. Sleet is the frozen precipitation which melts in thin warm air and then refreezes again before hitting the ground. Freezing rain is also a type of frozen precipitation but it melts in the warm air and freezes again only after coming in contact with cold surfaces. Snow is a type of frozen precipitation which falls in the form of six sided ice crystals. Sleet falls as ice pallets and can be found bouncing off the wind-shields or the roof during the winters. Freezing rain refers to those rain droplets which freeze upon hitting the surface of the ground. Forms in clouds at temperatures below freezing point. The snow needs to be in a frozen state between the cloud to surface of the Earth. It does not pass through any warm layer to melt it. Layer of freezing air is quite thin, and thus the water freezes after coming in contact with the surface.